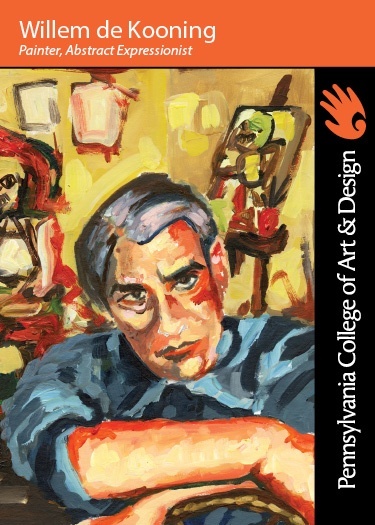 Willem de Kooning is one of the most notable Abstract Expressionist painters. His pictures exemplify the robust style of the movement, and it has been considered that he did more than any of his contemporaries to develop an abstract style of painting that combined Cubism, Surrealism and Expressionism. Willem de Kooning started training to become a commercial artist by attending night classes in 1916 in Rotterdam, Netherlands. By 1925, Willem emigrated to the U.S. where he met other artists including John Graham, Stuart Davis and Arshile Gorky, working for the Federal Art Project and creating murals from 1935 to 1939. These murals were abstract still-lifes characterized by geometric shapes and strong colors, showing the influence of his three new friends. By 1946, de Kooning begun his series of black and white paintings which became important to the history of Abstract Expressionism of their mixed media and unique technique. In 1950, de Kooning developed his first Women pictures, which was ultimately what he became most known for. The pictures portrayed such a strong feeling of passion that they caused a scandal at first. However, the female figure was an important symbol for de Kooning’s art career and his own life. He retained this form of art until the 1990s. Willem De Kooning was part of The New York School style of painters, a group which included Mark Rothko, Jackson Pollock and Franz Kline, among many others. In the 1950’s, De Kooning, keeping with his highly expressionistic style of painting, chose to explore his most famous subject matter, women. His portrayal of these figures are both emotionally charged and undeniably symbolic. In 1962, he was awarded the “Presidential Medal of Freedom." QUOTE: "I don't paint to live, I live to paint."